Thousands of protesters have controlled Istanbul’s main square once more after two days of violent clashes with rampaging riot police, as Turkey’s prime minister vowed to press on with the controversial redevelopment that provoked the clashes. Thousands of protesters have controlled Istanbul’s main square once more after two days of violent clashes with rampaging riot police, as Turkey‘s prime minister vowed to press on with the controversial redevelopment that provoked the clashes. Calling the protesters an “extremist fringe”, Recep Tayyip Erdogan blamed the opposition Republican People’s party for provoking the protests. “We think that the main opposition party, which is making resistance calls on every street, is provoking these protests,” Erdogan said on Turkish television, as an estimated 10,000 demonstrators streamed into the area waving flags and calling on the government to resign. 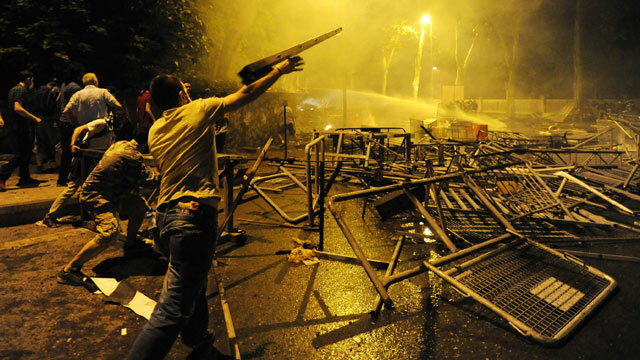 Protesters again clashed with riot police into the early hours of Monday, Reuters reported. In the western port of Izmir, protesters threw fire bombs at the offices of the ruling AK party and television footage showed part of the building ablaze. Bus shelters, paving stones and street signs were ripped up by protesters to make barricades that littered a major avenue in Istanbul where some of the heaviest clashes took place on Sunday night, Reuters said. Roads around Erdogan’s office in Istanbul were sealed off in the early hours of Monday. In the main street near the office, one demonstrator drove a small mechanical digger towards police lines as other protesters followed. Police raided a shopping complex in the centre of the capital Ankara where they believed demonstrators were sheltering, detaining several hundred, Reuters said. What started last Monday as a relatively small, peaceful protest to save an inner city Istanbul park from having to make way for a kitschy Ottoman-style shopping centre, rapidly snowballed into the largest and most violent anti-government protests that Turkey has seen in years. Hundreds were injured, some seriously, by the heavy-handed police response and excessive use of teargas. Riot police withdrew from the city on Saturday evening, handing a victory to the demonstrators. The protests had spread across Turkey to half of its 81 provinces by Sunday, the interior ministry, Muammer Guler, said. Guler said 1,750 people had been detained since Tuesday, but most had since been released, while damage costs have not yet been announced. The Turkish Doctors’ Association said the demonstrations had left 1,000 people injured in Istanbul and 700 in Ankara. The dramatic events also exposed the complicity and almost complete government control of mainstream Turkish media, which has largely failed to report the protests. Human rights groups have repeatedly expressed their concerns about the lack of freedom of expression in Turkey, and Erdogan routinely criticises media outlets and journalists who do not agree with his views and those of his ruling Justice and Development party (AKP). Opposition politicians urged Erdogan to listen to people instead of trying to silence them. Despite opposition from urban planners and environmentalists, the AKP government is pushing ahead with several huge construction projects in Istanbul, including a third bridge over the Bosphorus, a third airport and a giant mosque. Caliskan suggested that these plans might have to be buried or at least altered after the protests at the weekend, along with the AKP’s recent plans to restrict alcohol consumption, ban abortion and install an Erdogan-led presidency in Turkey. The prime minister’s key political project is to enact a new constitution, making the government system presidential rather than parliamentary. After 10 years as prime minister, his aim is to become Turkey’s first directly elected president with strong executive powers. He may have hurt his chances of seeing that happen this weekend. Other analysts stressed that the PM is still one of Turkey’s most popular politicians, and that while his image of being all-powerful may have been tarnished by this weekend’s events, the AKP still benefits from the lack of a coherent and strong opposition to challenge him at the ballot box. The battle appears far from over. Erdogan refused to back down on the development project that triggered the protests – the demolition of the city centre park to make way for a shopping centre, mosque and a replica of an old military barracks.